Grippers are used to grip, pick-up and orient a workpiece. Most grippers on the market are pneumatic giving the user only the control to open or close the gripper. Electromechanical grippers provide the user more control in being able to close or open it partially at a controlled speed. Users can then control the acceleration, velocity, position and even force with which the grippers open and close providing a much greater level of control and variation to your application. An added benefit of using our electromechanical grippers is not needing to feed the gripper with air. This is especially beneficial when the rest of your application is electric and the only pneumatics are the gripper. Now distributed worldwide, the Swivellink® product line has been used for hundreds of different applications in all types of industries. Used for vision systems, cycle start buttons, sensors, lights, monitors, part fixtures, tool holsters, and robot applications. The possibilities are endless for your mounting solution. Vacuum suction spiders can be manufactured with made-to-order specifications designed for your application needs. 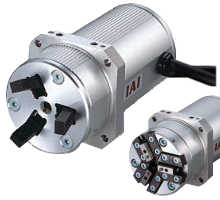 Vacuum suction spiders are available in a basic modular design and can be flexibly optimized for complex handling tasks. 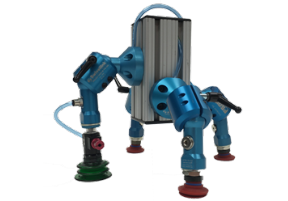 Robot grippers are equipped with enhanced process safety due to integrated system monitoring and sensor technology.